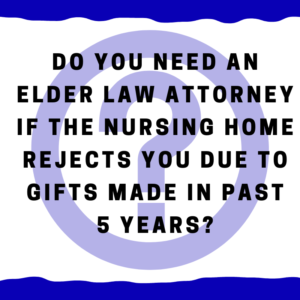 Do you need an elder law attorney if the nursing home rejects you due to gifts made in past 5 years? When you talk to a nursing home about getting long term care for your parent, they will ask about gifts your loved one made in the last five years. This is not being nosey — instead, the nursing home wants to know if your parent will qualify for Alabama Medicaid. (The exception is if there is plenty of money to privately pay the $7,000 or $8,000 a month nursing home bill). 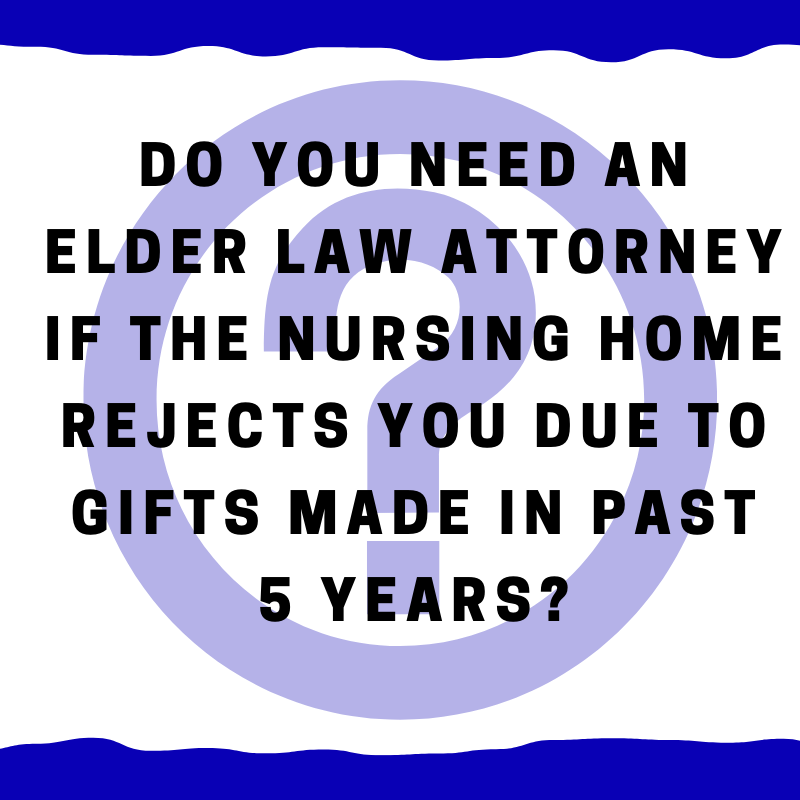 If there have been a number of gifts, you may be rejected by the nursing home. Kind of like a GPS — let’s first figure out our “current location” so we can start to pick the path to get to where we need to go. What is the exact amount of the gifts made by your parents in the last 60 months? We look back over the last 5 years — 60 months — and figure out the total of the gifts made. This includes any gift made by either your parent and their spouse. And by “gift” I mean anything less than the full fair market value. You list out each one and the next step is to note the timing of each gift . . . . When exactly were the gifts made in the last 60 months? This can make a huge difference. Maybe the total of the gifts is $300,000 but $250,000 of that was a condo given away 59 months ago. Then we will wait until we are more than 60 months away from the gift of the condo to apply — that brings down the total amount of the gifts. Here is an example of this. Let’s see what the total amount means in terms of a “penalty” period that your parent has to privately pay for their nursing home. Now let’s calculate the penalty period under Alabama Medicaid? We take the total amount of the gifts and divide this by $6,200. So if the gifts are $186,000, then this divided by $6,200 is 30. 30 months of penalty that Alabama Medicaid will not pay from the moment that your loved one is approved to be on Alabama Medicaid. If it is $62,000, then the penalty will be 10 months. Can you come up with a plan to pay through the penalty period? If the gifts have already been made, then unless they are given back, there is nothing to be done other than to deal with the penalty. Often we will intentionally give away assets, triggering a penalty, because it can save the family money in the long run. But let’s assume the gifts were made. How do you pay through the penalty period? Your loved one has to qualify by having low assets to apply. We have to look at the assets remaining, make some decisions so that we have the resources to pay through the penalty period. We might make a loan. Perhaps we will purchase a special type of annuity. Or set up a trust. There are all sorts of answers — the bottom line is you have to explore these under the Alabama Medicaid rules so you know your options. Because the nursing home is going to want to be comfortable that it will get paid before it will let your parent in. So if you are in this position, get with an Alabama elder law attorney that you trust so that you can fully understand your options and make the right decisions to get your parent the care they need. PS — If you would like to chat, call us at 205-879-2447 or fill out our contact form here.